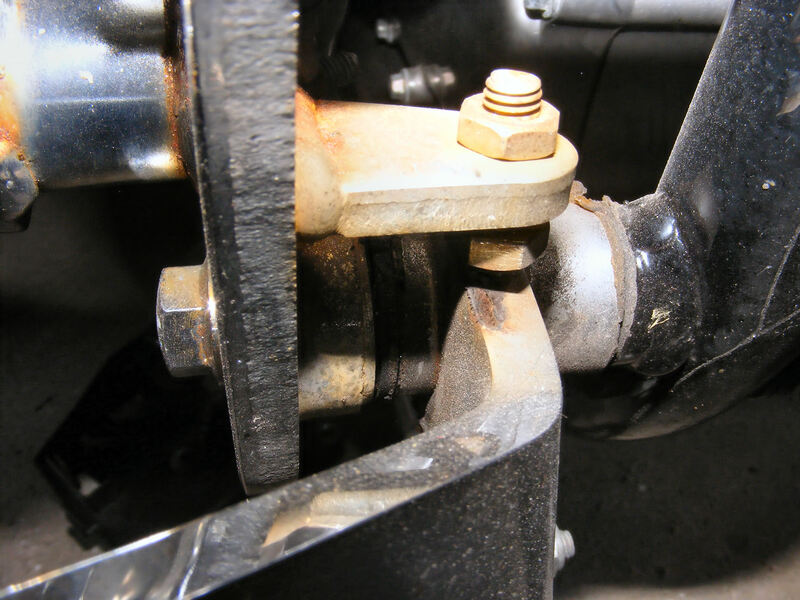 04/13/2010: I had some ambiguity about how to reassemble the rear brake pedal on my Honda. I'm posting my notes here in case they are helpful to others. 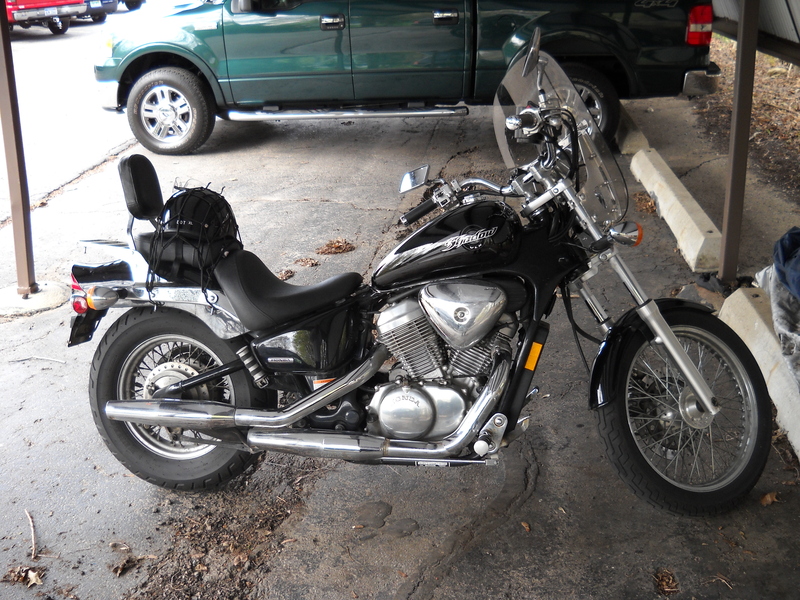 This is my 2006 Honda Shadow 600 (VT600C). It has been a great motorcycle. It survived a few spills as I learned to ride. It now has 24,000 miles on it, and it is on its second chain and third set of tires. I noticed that my motorcycle shift lever was a little stiff. 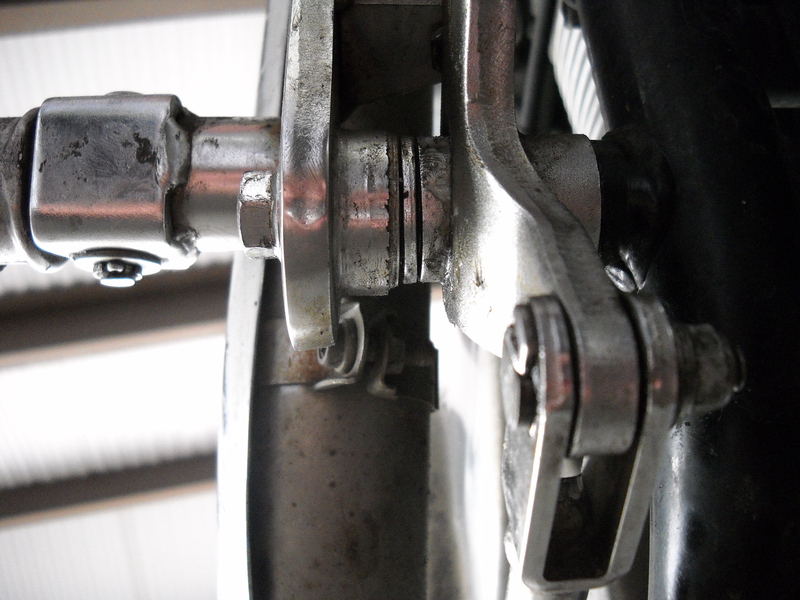 I decided to re-grease the pivot and the two joints in the linkage. I thought I might lubricate the rear brake pedal at the same time, as that had never been done in the life of the motorcycle. Between the pedal bracket and the rear brake pedal. Between the rear brake pedal and the frame. I thought perhaps the shop manual would help, but there were no photos or diagrams that showed the placement of the inner washer. I then thought that perhaps the parts information online would help. 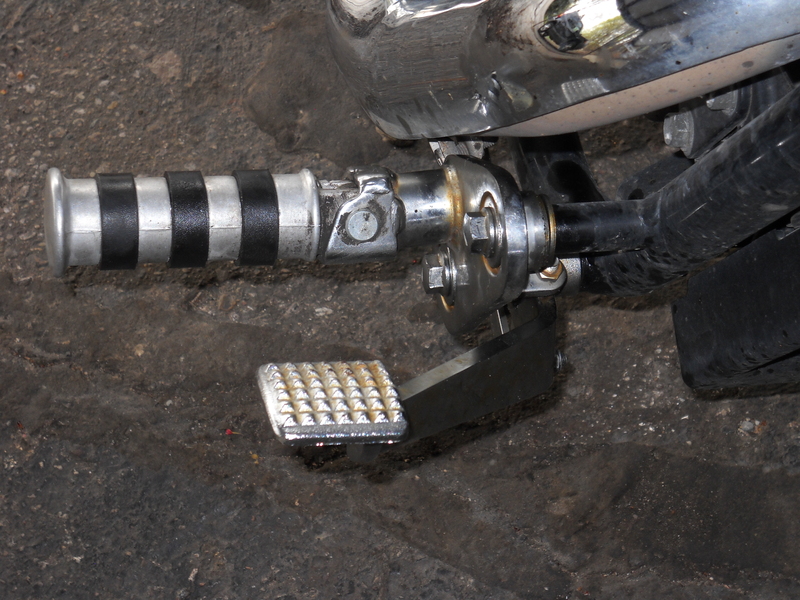 However, I discovered that the rear brake pedal is shown on the "Pedal" fiche and the bolt that acts as the pivot is shown on the "Step" fiche. This didn't really settle the issue of the location of the inner washer. I reassembled the pedal with the washer between the pedal bracket and the pedal and ensured that the pedal didn't bind. Then I rode out to the dealership in Kalamazoo to see if they could help. They had exactly the same materials I had (shop manual plus parts fiches), and indicated that they believed the washer went between the pedal bracket and pedal, but weren't sure. They also searched the showroom floor for similar motorcycles to see how they were assembled, but there were none with a similar rear brake pedal design. Then I searched eBay and CycleTrader to see if anyone was selling a similar motorcycle and might be able to help by inspecting their motorcycle. The photos below show how mine is presently assembled. I'm not confident that this is right. This is the rear brake pedal area. These photos show how my motorcycle is currently assembled. In the third photo, the washer location is shown in red so that there is no ambiguity about where I placed the washer. 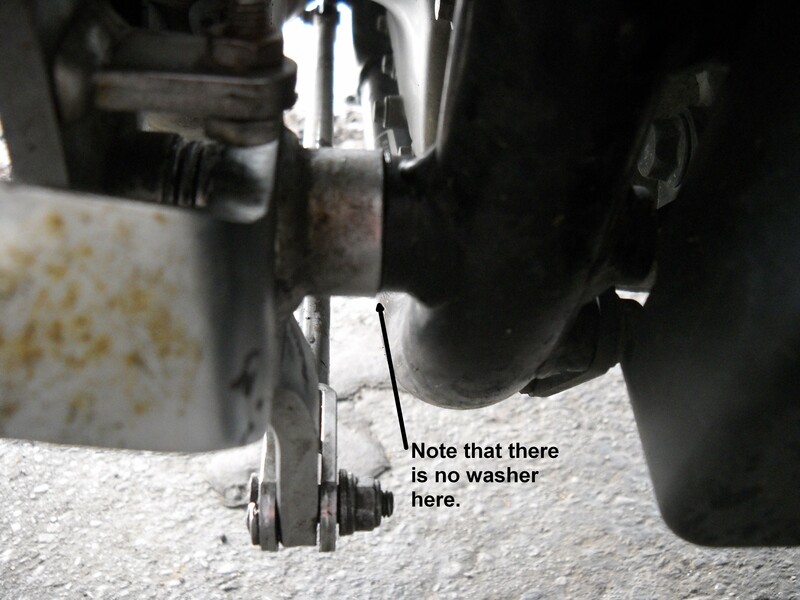 This annotated photo shows where the washer is not. 04/14/2010: I received a very helpful e-mail from Jerry Hogan indicating that, based on the motorcycle he has access to, he believes I have the washer in the right place. I also received a very helpful e-mail from Beach27288 indicating that he believes I have the washer in the right place. 04/15/2010: I received a helpful e-mail from Gym J. including photos (below). Gym J. believes that I have it assembled correctly. 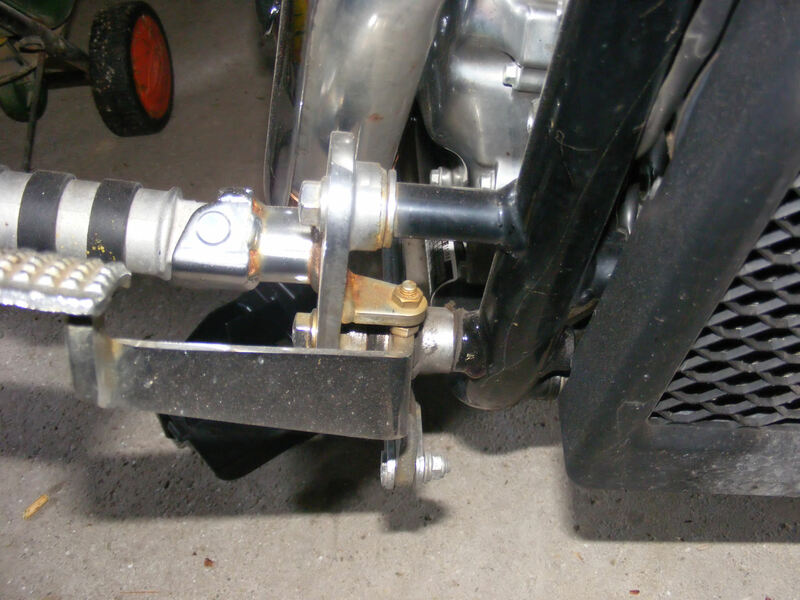 In the photos provided by Gym J., it appears that the washer on his motorcycle is a darker color than the washer on mine, but it appears to be visible and between the bracket and the pedal. 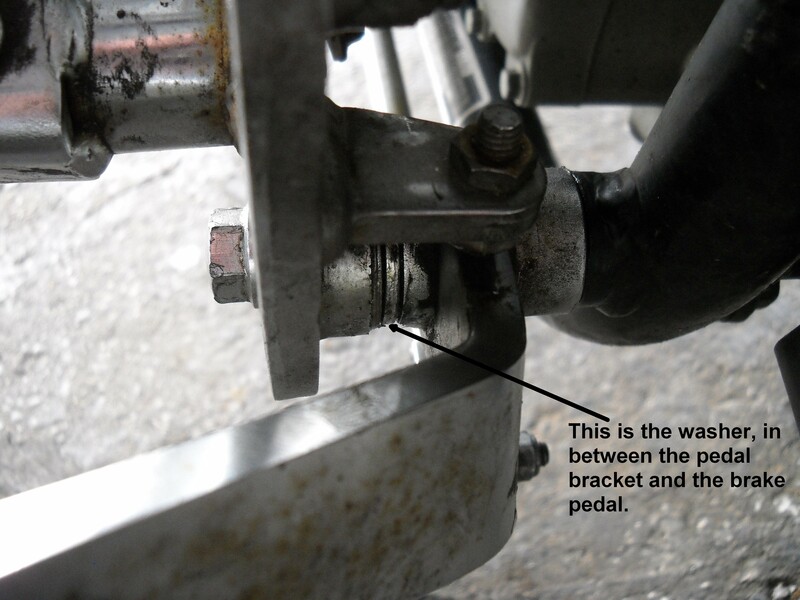 Summary: The washer goes between the bracket and the pedal, not between the pedal and the frame.